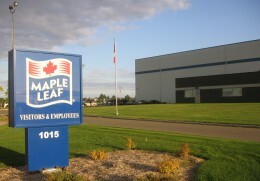 Maple Leaf Building is an industrial building constructed in 2008. The property is located east of a major roadway within the north industrial district of Saskatoon. The area has excellent transportation access to Highways 11 and 12, as well as the Saskatoon John G. Diefenbaker International Airport. Maple Leaf Building comprises 163,418 square feet of leasable area. Of the leasable area, 140,000 square feet is freezer and cooler space, while the remaining 23,418 is office space. Maple Leaf Building is 100% occupied by Maple Leaf Consumer Foods Inc.